Living with Asperger's is not an easy feat. But I have a message for you all: never let your circumstances define who you are. You can be anything! Freedom? What is freedom? 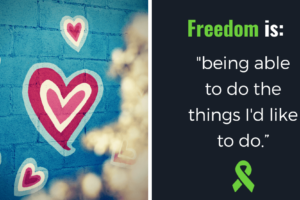 To me, freedom is having the will to do whatever you please, without judgement or criticism. Being free is loving who you are, accepting your flaws and your perfections. Being free is getting the best out of your life, no matter what may be going on in it. Freedom is a way of showing your human spirit. Living with Asperger’s is not an easy feat. It never is. Imagine yourself in a room full of people. All of those people are laughing and mingling. Meanwhile, you aren’t. You’re sitting there in the corner all alone, watching everyone make nice with each other. Nobody even acknowledges that you’re there. You just sit there, crushed from the inside. You have trouble expressing yourself because you don’t know how to. Your fear of being rejected eats you up. Your fear or feeling inadequate to others eats you up. As you’re living with Asperger’s, those whom you’re around can’t understand your pain. You’re constantly feeling glum and angry. You feel as if this condition drags you into an abyss, an abyss that leads you to a point of no return. I have this feeling. I lost my father when I was just a year old, and his loss alone has had a grave impact on how I grew up. As a black man, growing up without a father—that’s not easy. My father was a very outgoing guy. Everyone loved him. You would never be able to tell if he was sad. He was so resilient. Everyone tells me I look like him so much, but I’m his complete opposite. I’m not as outgoing as he was. I’m reclusive and shy. I don’t open up too much. Growing up, I could never fit in with others. As a kid, I couldn’t look an adult in the eye. I never had the capacity to. There was just something about looking at another person that made me feel very uncomfortable. In social situations, my heart would pound very fast. I would tend to get nervous. I would always be the one that got left out because I couldn’t relate to the other children. Being bullied didn’t help curb my condition, either; it only worsened it. Every day, I would walk around and get laughed at. I would be humiliated every day. I would be made fun of because of the way I talked, walked, and looked. Imagine trying to answer a question in class and the kids would mock you. Every word you would say, they’d make this expression, trying to take the words from out of your mouth. As I was around my family, they couldn’t relate to my condition either. I constantly sent them cries for help and they rejected me. Nobody listened. This only made me feel even more depressed. The bullying in school got so bad that I nearly tried to kill myself at the age of eleven, but my mom stopped me in the process. I would use writing as my means to communicate. I loved to write. Whenever I was in class, I would be the first person to get up and share what I’ve written with the class. I impressed my teachers with my impeccable writing abilities. My creativity was amplified. There was nothing limiting it. But, that didn’t mean my issues with my low self-esteem and my inability to become proactive in social situations waned. The kids would call me all sorts of demeaning names, such as retarded, stupid, and many more. These issues with bullying and my bout with Asperger’s did not cease. At the age of fourteen, I was booked into a mental hospital. They had me on medications for a while. I ceased taking them in 2013. None of that helped. Once I got to high school, I began to give up hope. I felt like there was no haven for a guy like me. I carried all this baggage. I bared all these wounds. Nobody could understand what I had to go through. But, I didn’t stop writing. I let my talent weather the storm. I let the arts influence me. Writing was my only escape. It was the only place I could go and not be judged or harassed. Little did I know this escape pushed me to write my first book at the age of fifteen. On October 26, 2014, I published The Ballad of Sidney Hill. That book marked my coming of age and how much I’ve matured. Publishing my book was proof that I wasn’t going to let a mental disorder define me. They told me that I wouldn’t be able to function once I got to high school. All the specialists who remained doubtful of my growth because of my condition—I proved them wrong. Fast forward to now, I have written forty books. I am now attending Berkeley College in Newark, New Jersey. I have a message for you all: never let your circumstances define who you are. You can be anything! Before you go…If you found this article helpful, please support our #GivingTuesday campaign. We’ve set a goal to raise $5,000 so we can continue (as a nonprofit) providing resources and support for mental health. Giving Tuesday is a global day of giving following Black Friday and the Thanksgiving Weekend. There are only a few days left–will you help us fight stigma and advocate mental health? Thanks for another successful Giving Tuesday! Thanks to you, we exceeded our goal! 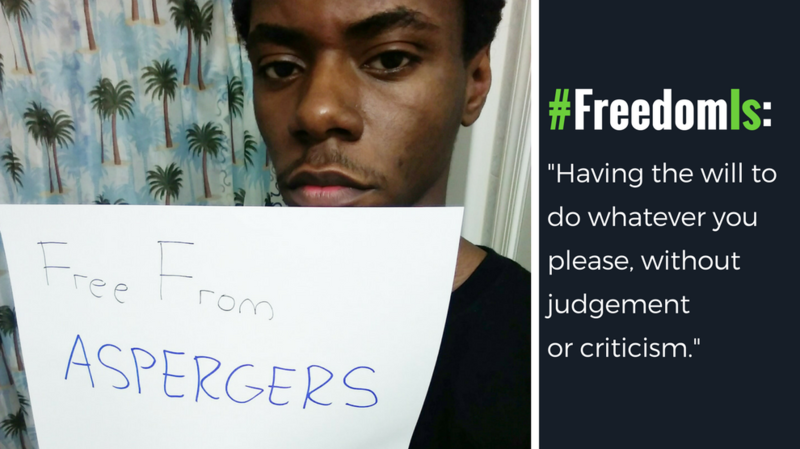 #FreedomIs having the will to do whatever you please, without judgement or criticism. 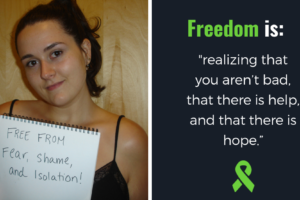 Our Community Blog and #FreedomIs project are about sharing stories and celebrating freedom. 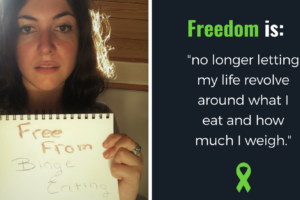 Take part by posting your “Free from” photo to social media and stating what freedom means to you. Don’t forget to tag us using #FreedomIs and @liberomagazine. Want to submit your story? Click here!